Calla Lily is pleased to announce that we are starting Tucker University featuring Deb Tucker's innovative rulers. Join us as we start the Freshman Year of Tucker University. Taught by a certified instructor, using the Deb Tucker rulers to help make each block a success in piecing and in visual impact. We will have a new ruler technique featured in her series each month. Learn how to make several blocks from one ruler. This will help you build accuracy in your sewing and quilting projects by adding just a little bit extra in your fabric to trim down to the perfect unit. Start with your basics in the first year and work your way up. Gaining knowledge in how easy it is to design the project you want from split rails, Lemoyne Stars, wing clippers, pinwheels, corner units and migrating geese. 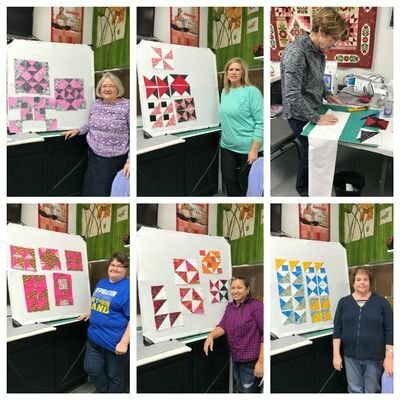 Each month a new block and piecing tutorial will be taught in class. At the end of our first year you will have a gorgeous quilt with perfect triangle points, squares and rectangles. Bring in your machine for class, your choice of fabrics, you will receive a packet the first month to make 4 blocks using Deb Tucker unique rulers.